After losing to the Arizona Diamondbacks 4-3 last night, the Los Angeles Dodgers have their backs against the wall as they could potentially not make the playoffs this year as both the Colorado Rockies and the St. Louis Cardinals are trailing behind at most by a game. With four games left in the regular season left, there is no room for error as the Dodgers need every win they could get in order to clinch a playoff berth. With one game left against Arizona and three games against the San Francisco Giants on the road, the path to the playoffs isn’t that simple. 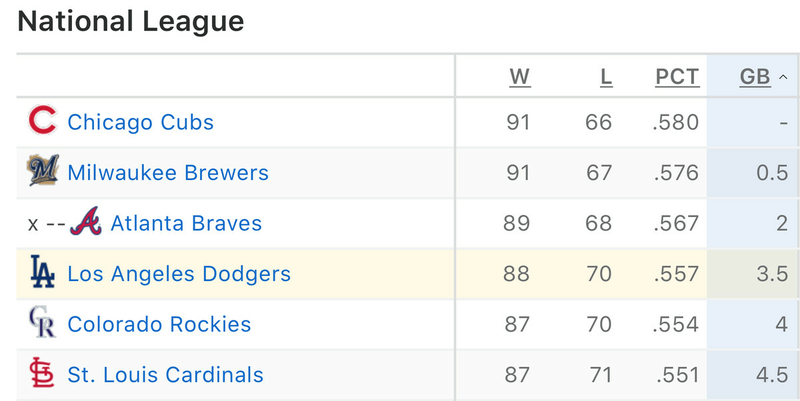 Based on the current standings, if the Rockies win out, they’re guaranteed a tie with the Dodgers for the top spot in the NL West. If the Milwaukee Brewers win out and if the Chicago Cubs lose one game out of their remaining four, the NL Central will end up with a tie. This is utter-chaos as even one game for any of the teams listed could end up costing them a playoff berth this season. One of the saving graces for the Dodgers are the Cardinals’ schedule. They finish up their series against the Brewers and head to Chicago to take on the Cubs in a three game series. The chances of the Dodgers making the post-season is still good, however, the division is what they want as they’d rather not be playing in the wild-card round. The Rockies schedule isn’t as intense and difficult as they will be closing out their season by finishing their series with the Philadelphia Phillies who are one a six game losing streak and will be taking on the Washington Nationals in a three games series. It’s definitely manageable for the Rockies to win out and it’s essential for the Dodgers to not lose any games. Speaking of the Dodgers, it’s upsetting to think of the fact that their long-time rival in the San Francisco Giants, can eliminate them from playoff contention. However, the Dodgers need to focus one game at a time and can’t be concerned with their future opponents. They just lost to the Diamondbacks by one run and had felt that they should’ve won. The Dodgers have been playing their best baseball as Buehler has been saving the team in terms of pitching as Clayton Kershaw has been injured and struggling this season. Buehler has had a magnificent season and is a Rookie of the Year Candidate as he threw for 12 strikeouts in 6 innings against the Rockies last week and overall has seven wins and an ERA of 2.74. He has also had 143 strikeouts and a WAR of exactly three as he has assisted the Dodgers into a potential championship season. There is no doubt that the Dodgers are confident that they can make it to the post-season this year, however, they need to be careful as one loss could end up being tragic for their season. After adding superstars like Manny Machado to the team, it’d be extremely disappointing for the Dodgers to not even make it to the post-season this year. The Dodgers have been playing their best baseball as of yet and it’s essential for them to close out this season with the intentions of winning all their games. Playoff time is here and if the Dodgers want to damage in the playoffs, they need the right mindset and need to show consistency in their play.